You can expose your viewers to other videos in your collection by creating video playlists and using video recommendations. Use the video player's playlist method to create a set of videos to play in your video player. You can define a list of public IDs to include, and optionally set transformations for each source. Alternatively, you can generate a playlist based on all videos in your Cloudinary account with a specified tag. After you have defined a playlist, you can use playlist methods to control the list. 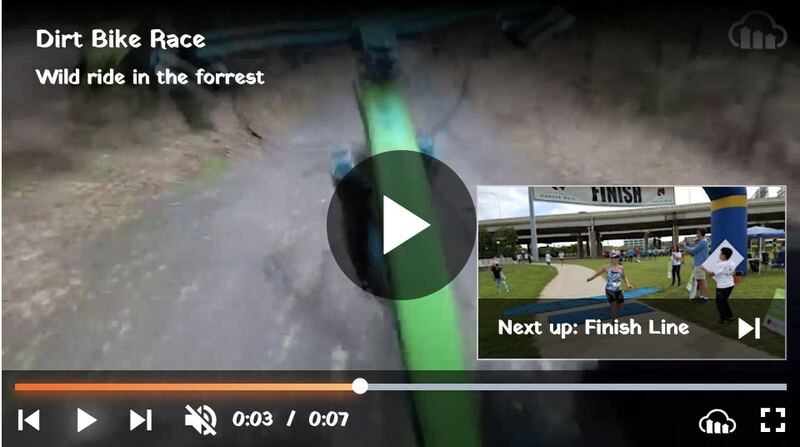 For example, you can jump to the next or previous video, jump to a specific video in the playlist by index, determine whether to auto-advance to the next video when the previous one ends, retrieve the total number of videos in the list, and more. The following example creates a playlist with the videos IDs: book, ocean, and dog. The book video plays with a transformation that overrides the default player settings. 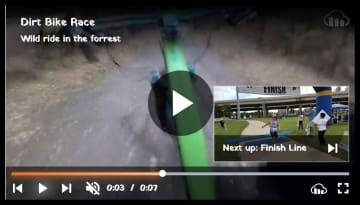 The next video in the list automatically begins 10 seconds after the previous, and then repeats the playlist from the beginning after the last video ends. See playlist.html in the sample CodePen to see a sample video player with a play list, including Next and Previous buttons. For details on all available playlist methods, see Playlist operations in the Video Player API Reference. The playlistByTag method performs a call to the client-side resource list operation and returns a promise object that when fulfilled, returns the player with the playlist. To enable this functionality, make sure that the Resource list option is not restricted in your account settings: In the Cloudinary console, go to Settings > Security > Restricted image types, and make sure the Resource list option is not selected. The playlistByTag method receives the tag to use and a set of options. In addition to setting the autoAdvance, repeat, and presentUpcoming parameters, you can also optionally provide a sorter (receives the name of a function that determines the sort order of the retrieved set of videos) and a sourceParams object (enables you to set transformations that will be applied to all the retrieved videos in the playlist). When creating a playlistByTag with the presentUpcoming parameter or when autoShowRecommendations is true, the titles, subtitles, and descriptions are automatically taken from the title entry of the resource's context data if it exists. Otherwise the public ID is used instead. 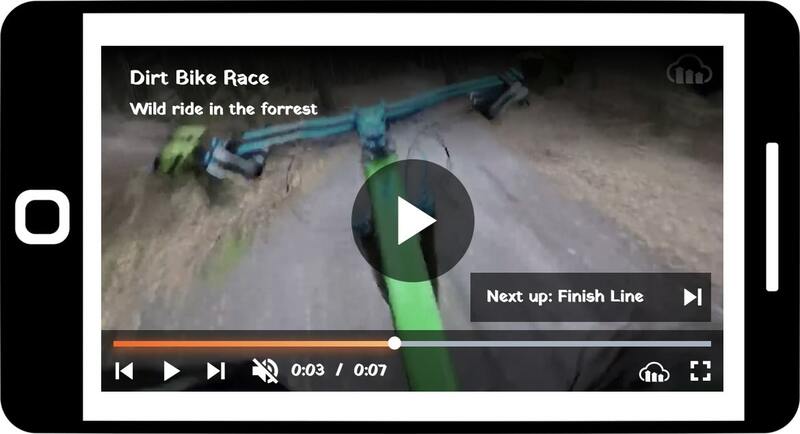 You can add a video title (as well as a subtitle and description) to the resource context using the Upload or Context methods of the Upload API or via the Media Library. See playlistByTag.html in the sample CodePen to see a playlist generated by tags, including a sorter function. You can also use the sourcesByTag method to retrieve the sources for a specified tag without actually creating the playlist. This method has the same syntax and supports the same options as the playlistByTag. The example below retrieves (the promise of) the sources data from all videos with the tag, "demo". When the promise is fulfilled, it passes the sources to the playlist method. playlist widget - A scrollable list of the upcoming videos in the form of clickable thumbnails with titles. 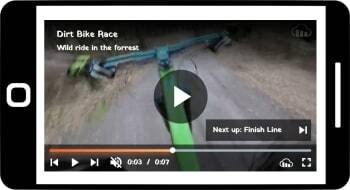 You can set the widget to display either vertically to the right of your video player, or horizontally below your player when viewed in a full screen web browser. Next up preview - A small clickable thumbnail with a title overlay (or text title in responsive view) that pops up in the corner of the player a few seconds before the current one ends. direction: Determines the scroll direction and location of the widget when viewed in a non-responsive display. horizontal: Displays the thumbnails of upcoming videos horizontally. The widget is located below the player and is in addition to the dimensions defined for the player. vertical (Default): Displays the thumbnails of upcoming videos horizontally. The widget is located to the right of the player and is displayed inside the dimensions defined for the player (the video is resized accordingly). In responsive/mobile view, the widget always adjusts to a single column vertical scrolling list below the player. total: The number of upcoming videos to include in the widget (may be less than the number of videos in the actual playlist). Keep in mind that regardless of the number specified here, a maximum of four thumbnails can be displayed on screen at once. If a larger number is specified for total, the widget enables the user to scroll to view the rest. Set presentUpcoming to true, to display the upcoming video at the default time of 10 seconds before the end of the video. Alternatively, specify how many seconds before the end of the video the preview should display. If your playlist is set to repeat, then the upcoming video thumbnail shows the first video when the last video nears the end. Otherwise, no upcoming video is displayed at the end of the list. If you have not set a title for a particular source in your playlist, either in the context of the resource itself or in the <video> tag source definitions, then the source's public ID is displayed instead of the title. For details, see title values. You can set your video player to show up to four video recommendations in a recommendations overlay pane when a video finishes playing. This can be for an individual video, or at the end of each video in a playlist as long auto-advance is disabled (autoAdvance: false). 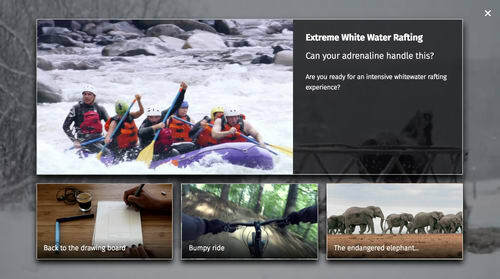 The recommendations pane displays one primary recommendation including large thumbnail, title, subtitle, and description (if they are defined for the relevant source), followed by up to three secondary recommendations, with a smaller thumbnail and the video title or public ID. Pass autoShowRecommendations: true when creating the player, or trigger player.autoShowRecommendations(true) at a later time. Add a recommendations parameter to each video source for which you want to show recommendations after it. The parameter value is an array of video source objects (or a function or Promise that resolves into an array of video source objects). For best results, make sure that each source you define as a recommendation has a title, sub-title, and description defined, either in the source definition or in the context of the resource itself. If you create a playlist with auto-advance disabled (autoAdvance: false) and autoShowRecommendations: true, then by default, the next videos in the playlist are automatically displayed as the recommendations. In this case, if a viewer selects one of the recommendations, they remain within the context of the playlist. If you explicitly specify recommendations for the sources in your playlist, those are displayed in the recommendations pane. In this case, if a viewer selects one of the recommendations, they exit the playlist.